The Thur valley branch line from Mulhouse (or - to be exact - from Lutterbach junction) to Thann and Kruth is not only the oldest branch line, but the first railway to be opened in Alsace anyway. The Mulhouse - Thann section opened on September 2nd 1839, i.e. one year before the first sections of the Basel - Strasbourg main line. The birth of both lines is normally associated with the name of the Mulhouse industrialist Nicolas Koechlin who was one of their main promoters. As a matter of fact, it were the factory-owners of Mulhouse, engaged in the textile business and organised in the powerful "Société Industrielle" (Mulhouse Industrial Society) who showed early interest in the development of railways in order to facilitate the supply of raw material. The Mulhouse - Thann line was chosen for the first rail link not only because there already was intense traffic between the two cities but also because this route was intended to serve as an experimental line for more ambitious enterprises. 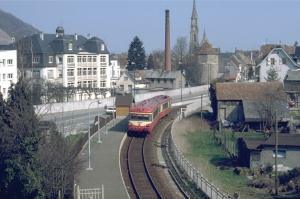 According to the first project the line would have started at the Mulhouse harbour on the Rhine-Rhône canal, near to nowadays SNCF stop Hasenrain on the Mulhouse - Belfort line, but this was changed because the Mulhouse - Lutterbach section of the Thur valley line was soon intended to be used also for the Mulhouse - Strasbourg main line, the construction of which was decided at about the same time. In 1853-54 the Basel - Strasbourg and the Mulhouse - Thann companies merged with the Paris - Strasbourg company that became the Compagnie de l'Est later on. The financial results of the Mulhouse - Thann venture unfortunately did not meet the expectations, and therefore in 1853 an extension further up the Thur was decided in order to connect with more textile plants. This extension, however, was built only when Est had taken over the line, and was opened in 1863 between Thann and Wesserling (12,9 km). From Wesserling, a Trans-Vosges extension was planned to connect with the Upper Moselle branch line at Bussang. Concession for this line was granted in 1870 but the Franco-Prussian war prevented work to begin. At the turn of the century - and thus under German administration - a decision is made to push the line up to the last important village of the Thur valley, Kruth. This 4 km extension was opened in 1901. Plans to link the Thur and the Upper Moselle branches resurfaced, and in the 30's, with Alsace being part of France again, work on a Wesserling - Saint-Maurice link under the Bussang pass actually began. But when the Bussang pass base tunnel was excavated for about 4 km length and a huge stone-arch viaduct built near Urbès, work was stopped for technical reasons. The viaduct can still be seen today as a strange solitaire in the Urbès' valley's charming landscape. An important project that would have affected the Thur valley line was the intended construction of a Belfort - Bollwiller (- Guebwiller) rail link which would have been an elegant detour line avoiding for main line trains Strasbourg - Lyon to pass through Mulhouse. This line would have crossed the Thur branch at Cernay. Concession for the Belfort - Bollwiller link was granted to the Est company in 1861, but the company was not really interested in this line and only built the short Cernay - Sentheim section, opened in 1869, which was extended - in a tramway-like manner, the track being placed next to or on local roads - to Masevaux in 1884 and to Sewen in 1901. The through line Belfort - Bollwiller never materialised, and therefore the Cernay - Sewen line, also known as Doller valley line, remained a branch of the Thur valley line. Due to the density of local population and the importance of freight traffic (namely to the Thann chemical plants which evolved out of factories that produced dyes for the textile industry), the Thur valley line has always been very busy and was never really threatened by closure. The number of passenger trains, all operated by EAD X 4300 railcars today, has been constantly increased during the last decades so that today there are 8 pairs of trains running between Mulhouse and Kruth plus some partial workings that run between Wesserling and Mulhouse or Thann and Mulhouse only (table 195 in SNCF's National Timetable). Oddly enough, Sunday train service was replaced by buses more than 25 years ago, although the line opens up areas of scenic beauty so that excursion traffic maybe would be substantial. During the last years, there have been repeated suggestions to electrify the Thur valley branch and to increase train speed and frequency. Recently, another project was announced by the city of Mulhouse that wants to built a new interurban light metro system, with streetcar-like rolling stock running on tramway tracks in the city centre and using existing railway lines outside the city area (a system developed and operated successfully by the Albtalbahn company in and around Karlsruhe in Germany). This ambitious project provides for an inclusion of the Thur line in a second phase of realisation, so that one day there might be tramway vehicles running up this charming Vosges valley. But everyone who knows how the public transport scene works in France, can only be sceptical as to if and when this might become reality. Railway photographers won't find much interest in the lower part of the Thur valley line, except for the station of Cernay which unfortunately is in rather derelict condition today. But there are plenty of wonderful photo locations as soon as Thann is reached. 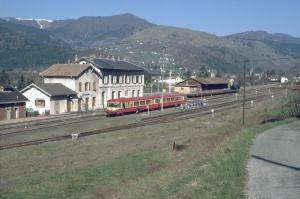 Thann station has regular and active freight traffic (which is no longer the case on the section further up), and train movements in the station may be photographed with Thann's 14th century cathedral in the background. 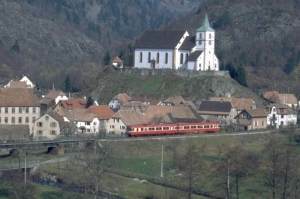 Between Thann and Kruth, every village boasts nice photo spots, almost always with a church next to the track, but in that respect the most beautiful point certainly is the village of Oderen near the upper end of the line. The endpoint of Kruth, on the other end, is of little interest as almost all tracks except for the platform track have been lifted. A word has to be said on the Doller line that branches off at Cernay. Despite the scenic beauty of the Doller valley, passenger service on that line was stopped in 1967. In the 70's an enthusiasts' association was founded under the label "Chemin de Fer Touristique de la Vallée de la Doller" (CFTVD), with the intention to operate the upper section Masevaux - Sewen, which is by far the most beautiful part of line, as a heritage and tourist railway. Lack of support from municipalities prevented this project. Instead of this, tourist train operation started in 1976 on the lower part of the Doller line between Cernay and Sentheim that unfortunately lacks the scenic beauty of the upper section. The CFTVD operation, which starts at a stop called Saint-André near Cernay SNCF station, is still active on many Sundays during the summer season. To close this description of selected branch lines in the Vosges mountains, here is some bibliographical reference.